ORLANDO, Fla. – Southern Utah’s Cam Levins and LSU’s Kimberlyn Duncan were named winners of The Bowerman on Wednesday in front of a packed house at the U.S. Track & Field and Cross Country Coaches Association (USTFCCCA) Convention at the JW Marriott Grande Lakes in Orlando, Fla. 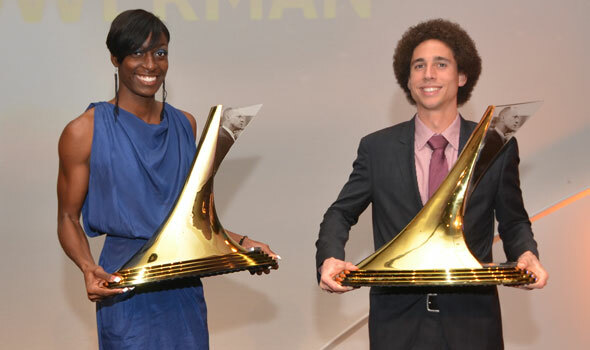 The Bowerman is awarded to the most outstanding collegiate male and female athlete of the year. Levins (Black Creek, B.C.) swept NCAA Outdoor crowns at 5000 and 10,000 meters in 2012, becoming the first to do so since 2009 when Oregon’s Galen Rupp – The Bowerman winner from that year – did so in Fayetteville, Ark. Using a 58.06 final lap split, he maintained his two-second lead to take the 10k title in 28:07.14, the best time in meet history since 1984. In the 5000, Levins closed in 54.28 on the final lap and 1:59.66 over the last 800 meters, to win by over a second (13:40.05). Earlier in the season, on two consecutive weekends, Levins jumped into the record books with big runs at the Mt. SAC Relays and Payton Jordan Cardinal Invitational. At the Mt. SAC Relays, Levins would outrun Arizona’s Lawi Lalang in a 5000-meter thriller to clock the NCAA’s best time of the season, 13:18.47. The mark is fifth all-time in the collegiate ranks and the fastest by a collegian since 2008. At the Payton Jordan meet, Levins would run another winning race against a stout field of pros and collegians with a 10k world-leading run of 27:27.96, topping Sam Chelanga and Stanford’s Chris Derrick among others. The time of 27:27.96 is also No. 2 on the all-time collegiate list. Two weeks removed from the Payton Jordan meet, Levins competed in five races at the Summit League Outdoor Championships and swept the finals of the 1500, 5000, and 10k. He was named the meet’s track MVP. Indoors, at the NCAA Championships, he placed third in the 3000 meters and fourth in the 5000 meters. He was named the Summit League’s Indoor Track Athlete of the Year after taking home four conference titles with victories in the 800, Mile, 3000, and 5000. He was the top collegian in the 3000 meters at the New Balance Indoor Grand Prix in Boston where he ran 7:45.75, the fastest time by a collegian since 2009 and eighth-fastest all-time. At the Millrose Games, Levins placed seventh overall in the Mile with a run of 3:57.16. Levins is the first from Southern Utah and the Summit League to win The Bowerman. Duncan (Katy, Texas) is the first in LSU history to win the award. In 2012, she became the first woman in NCAA Division I history to win back-to-back indoor and outdoor national titles in the 200 meters. This season, Duncan at the NCAA Championships won the 200 meters and finished runner-up in the 100. She crushed the field in each of the NCAA’s four rounds in the 200 meters, winning each race by at least three tenths of a second. In the event’s final, Duncan clocked 22.86 despite a 2.3 meters-per-second headwind. In the national semifinal Duncan claimed a new low-altitude all-time collegiate best time of 22.19 seconds. Indoors, Duncan notched her second-consecutive 200-meter title with a 2012 world-best time of 22.74. Duncan became the first to win back-to-back national indoor crowns in the event since LSU’s Muna Lee (2002-03). Duncan also claimed an eighth-place finish at the national championships in the 60 meters. Duncan had a full season – 65 races in all, including 40 during the outdoor campaign. She was undefeated against collegiate competition in the 200, winning six finals indoors and four outdoors. Combining all finals in individual events and relays during the outdoor season, Duncan went 20-for-24. She only lost once in the 100 meters and that was for second in the national final, once in the 4×400, once in the 4×100, and once in the sprint medley relay – both for second place at the Penn Relays. Duncan is the first in LSU and SEC history to win the award. The race for The Bowerman in 2013 will begin shortly with the release of the preseason men’s and women’s watch lists to be released in mid-January. The Bowerman, which debuted in 2009, is presented annually by the USTFCCCA to the most outstanding male and female collegiate track & field athlete in the nation. The award is named for is named for legendary Oregon track & field and cross country coach Bill Bowerman. Florida State’s Ngoni Makusha and Texas A&M’s Jessica Beard are the reigning winners of The Bowerman. Makusha won bronze in the long jump at 2011 IAAF World Championships. The U.S. Track & Field and Cross Country Coaches Association (USTFCCCA) is a non-profit professional organization representing cross country and track & field coaches of all levels. The organization represents over 8,000 coaching members encompassing 94% of all NCAA track & field programs (DI, DII, and DIII) and includes members representing the NAIA and the NJCAA as well as a number of state high school coaches associations. The USTFCCCA serves as an advocate for cross country and track & field coaches, providing a leadership structure to assist the needs of a diverse membership, serving as a lobbyist for coaches’ interests, and working as a liaison between the various stakeholders in the sports of cross country and track & field. For more information, visit USTFCCCA.org.